The Liberal Recreation Department in partnership with the Liberal Convention and Visitors Bureau will be presenting Brett Crandall in the Wonderful Wizard of OZ this Saturday, March 30th at the Randall Girls Scout Cabin in Light Park. There will be 2 performances of this staged literary classic by l. Frank Baum, 2:30pm and 6:30pm. Cost is $2 per person with the little “Munckins” 5 and under Free. 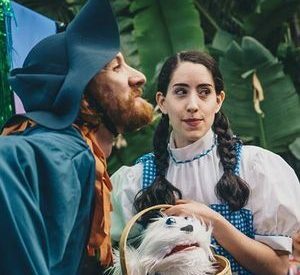 With the help of the audience and some playful puppetry, Dorothy can learn, “There’s No Place Like Home” to make your dreams come true. For more information, call the Liberal Recreation Center at 620-626-0133.